2016 Suzuki Address V125 Fuel Injection. Picture credits - Suzuki. Submit more pictures. 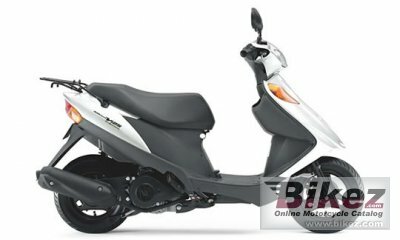 The performance of its smooth, efficient and highly responsive fuel-injected 125cm3 4-stroke SOHC engine. Precision engineering delivering optimum fuel economy and smooth, low-vibration operation. An expressive styling composed of edgy bodywork. Quality details like legshield-integrated front turn signals and sporty instruments. Ask questions Join the 16 Suzuki Address V125 Fuel Injection discussion group or the general Suzuki discussion group. Bikez has reestablished Bikez.info motorcycle web shop overview. Here we present the major online shopping possibilities for motorcycle parts, gear and accessories. This includes customizing and insurance. Search and compare products and prices. Try our 2016 Suzuki Address V125 Fuel Injection discussion forum if you have questions or comments. Information about any technical issue is always welcome.